Your first two albums came out over two years. This is your first album since 2010 and tracks like "Open Up (That's Enough)" have been out since 2013. So this one’s a long time coming, huh? 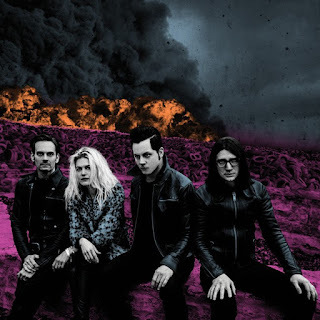 Alison Mosshart: I think collectively if you put all the studio days and work days of making this record it’s about three, or three and a half weeks. That tells you how infrequently we’re in the same town together and can work on stuff as a band. So, basically we grabbed those moments when we could. Dean Fertita: That’s right. There were some ideas that we had started in previous sessions, in 2009, 2010, but we didn’t look at them as potential for a song idea until more recently. But they existed. Whether it was just a snippet of a riff or something. When we decided, let’s take these couple weeks and see what we can do, we just brainstormed and looked at everything we had and that’s cool, run with that for a minute. What was it like recording this one at Third Man’s studio in Nashville? Jack Lawrence: The studio is definitely a fifth member of the band. You play off what you’re given. I don’t think a lot of people know about bleed in recording. So, we all record in one room together; most studios are separate. There are guitar amps in one room, there’s a bass amp in one room and the drums are in the middle. So, if you wanna pull down everything and leave the drums in, you can still hear guitar on it. So, when we’re recording and mixing you can’t just punch in. You have to use what’s there. This record has tons of mistakes on it. When you listen to music now, it’s perfect, because people are making it perfect. Mosshart: You have a physical human reaction to something that another human being made. When you remove the human from it and you chop it up, make it all perfect, you have a different reaction. Something is not there. You can feel it when it’s there. It’s interesting that you call the studio an extra member, because you often hear bands say that about their producers. What is it like working with Jack White as both producer and drummer? Fertita: As a drummer he gets to have a different vantage point for what he does. For me that’s really comforting because I could probably play things all day and it’s good that he can see if things are working from the inside out. I think makes for a much easier and quicker recording process. He’s decisive. That’s the idea -- let’s go -- off to the races. You guys aren’t touring behind the album. How come? Fertita: Schedules. The Kills are working on a record, Queens of the Stone Age are starting up again. City and Colour is starting up soon. Jack’s just been going forever so he just needs a minute. We all would love to play. Obviously, it’s our favorite thing in the world to play together. Maybe some day, but immediate future, it’s not happening. So, it’s just a logistical thing? You guys wanna play this album live is what you’re saying. Mosshart: Do you know how many records we could write in a couple years? I’m glad this music’s out there; it’s very hard to plan far ahead. There’s much going on and we’re all so busy. How come Jack White isn’t doing press this time around? Fertita: He’s doing a million other things right now. I’ve read his statements about how he doesn’t like trends in journalism about how clickbait-y things have gotten. Fertita: Right now he’s concentrating on Third Man opening a store in Detroit and there’s a lot of things going on in his world. We’re just happy that he’s able to be here to do this stuff.